← Finding Nemo in 3D Opens Today! Summer is not over yet. If I keep saying that it might be true! One of my favorite things about summer are the frozen drinks. Who doesn’t love a Strawberry Daquiri or Pina Colada? Daily’s Cocktails are the easiest way to enjoy these frozen delights. They come in Capri Sun style pouches and according to the website you just Freeze, Squeeze, and Enjoy! What could be easier? 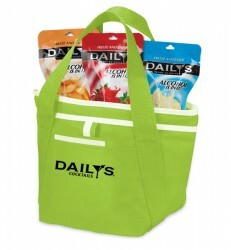 If you would like a chance to win the Daily’s Cocktail’s insulated lunch tote- the best way to carry around your frozen cocktails and keep summer alive all year- follow these easy steps. This entry was posted in Contests, Giveaways and tagged Contest, Daily Cocktails, Daiquiri, Frozen Drinks, Giveaways, insulated lunch tote, Margarita, Pina Colada, Strawberry Daquiri. Bookmark the permalink. I love a frozen drink. This looks great!! I love me some cocktails!! You are a winner- just make sure that you liked my facebook page as well!